All stories here are from the original Battlestar Galactica, not the new version. Its split into two sections, the first half is only Battlestar Galactica, the lower half is crossover stories. Starbuck and Apollo are out on patrol looking for new supplies, Cylons and Earth when they stumble across an unusual system. Going back to investigate they discover a young woman, what secrets does she hold, and why does she have golden eyes and speak in the ancient language? A short story about how Baltar gets rid of a rival paying the way for him to gain even more power. Join Commander Ares and the crew of the Argo as they head out on the mission to find Earth. (Takes place about 10 yehrens before the destruction of the Colonies). Hope Renewed – Short side story in the Battlestar Argo story. Looking for supplies the patrol runs across a Cylon attack. However, they gain help from an unlikely ally who has knowledge of Colonial technology and the Cylons, but how? Story about Cassiopeia on the day the Colonies were destroyed and how she got to where she was when discovered by Starbuck. Cylons have the Galactica and the RTF surrounded and on the verge of destroying them when an unknown fleet of battlestars arrives. Who they are will shock everyone. The Galactica and the RTF come across a new planet, what secrets does it hide. Meanwhile the Cylons have finally caught back up to them. While on the way to Earth, the Galactica and the fleet are rescued by a mysterious fleet of battlestar who refuse to communicate with them. Combines the stories of Battlestar Argo, The Sunflare Voyage, and Voyage to Earth. Several groups of Colonials are trying to find Earth while the Cylons are setting up traps to destroy them. 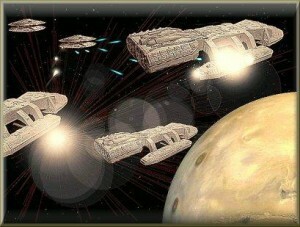 The Sunflare is a battlecruiser on patrol when the Cylons attack. Follow them as they try to catch up to the Galactica and the RTF. The Galactica has a strange visitor ship, what happens next surprises them all as a patrol picks up what they assume is a abandoned mining post. A Dr. Who BSG crossover. The Doctor and Amy accidentally land on a basestar and then the Galactica while trying to head to the beach. Its been twenty years since Earth was invaded, now there are some new invaders and perhaps some allies in the form of fleeing group of humans and a battlestar called Galactica. Part 1 of 3 stories. The Galactica and her new allies continue to work together as Cylons and the unknown aliens who threaten to destroy all of humanity close in. Part 2 of 3 stories. Crossover between BSG and ‘The Cimalian Princess trilogy’. 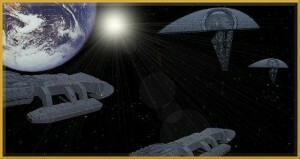 The Galactica and the RTF come across two empires, the Alliance and the Milsian Empire fighting for control. Which side should Adama side with? Crossover between BSG and Stargate: SG-1. While on patrol Apollo discovers an interesting building on an otherwise abandoned world and they head to find out what it is. Will it bring about their destruction of salvation. Its been a year since the refugees of the fleet went though the stargate. Now, Earth and the Colonials have build a new Galactica and its mission, to set up a post in universe the Colonials came from to spy on the Cylons. Peace between man and machine, the long lost hope for those in Zion. However something happens on the surface to the machines, a new enemy. The machines turn to those in Zion for help, even as a new group of humans from space come looking for them.